I told myself I wasn’t going to apologize anymore. But, I must. The last post I wrote was in February, before the Italy trip. Two months have passed. So, I must apologize—especially if you have checked alwaysorange with any regularity, wondering when I would finally write something. This post is a bit longer; in fact, it is part one. I promise you won’t have to wait two months for part two. Grab a cup of coffee—an espresso, perhaps—and enjoy. Where to begin? What to say? What to write? Italy was amazing. I fell in love with the place. I know, everyone says that. But it’s true. In the ensuing weeks (months) since the trip, my mind has been a collection of thoughts, images, and memories. I’m calling this post my “Top 5 Favorites” of Italy. Part II will be my version of a travel advice piece. How could I not start with the food? Mama Mia! Our travel package had Brad and I flying into Milan where we picked up our rental car for the week. Our hotel, Croce de Malta, was located in the smallish town of Montecatini, about a 3.5- hour drive from Milan. Florence the capital of Tuscany was a 40-minute drive from our hotel. Friends had told us about the Auto Grills in Italy—the US version of a toll oasis or a truck stop. They said if we wanted a snack or a coffee, we should stop. I’m sure I looked like the googly-eyed tourist as we walked into our first one. No row upon row of processed chips and cookies. Instead, I found myself looking at a food counter with sandwiches and pizzas nestled behind glass counters, waiting to be warmed for hungry customers. A full service coffee bar also served espressos, cappuccinos, and lattes. No plastic to-go cups here. Instead, coffee was served in porcelain cups with saucers. Once we picked our sandwich to share (ham, arugula, and cheese panini), the woman warmed it in the oven for us. Off to one side, I could see that this Auto Grill had its own bakery to make its bread each day. Really? Later that night, we headed out to dinner—I felt very Italian eating dinner at 8:30 pm, btw—to a local pizzeria called Don Chisciotte. This was our first introduction to authentic Italian pizza. Each pizza is meant to serve one person and comes on a large dinner plate. This isn’t thick- crust pizza. Most restaurants, maybe all of them, bake their pizzas in a wood-fired oven. The crust puffs a bit around the edges and often have a bit of char on them, making them look all the more rustic. The dough also has a pleasant “chew.” I ordered a cherry tomato and mushroom pizza. Brad had the ham and fresh buffalo cheese pizza. Our pies hit the spot and we topped off our evening with some gelato at a nearby cafe. Falling into bed that night, I couldn’t believe we were actually in Italy. While we ate many delicious meals, one of our favorites also took place in Montecatini. It was Sunday night and we had been gone all day to Bologna and then to Reggio Emilia to watch a soccer game. We wanted a relaxed, sit-down dinner. The woman at the hotel front desk came through with another winner and told us about Da Lorenzo. From the moment we walked into the restaurant, the service was attentive and friendly. Very quickly, we figured out that this was a family affair. As we met different members of the Da Lorenzos, we picked up pieces of their stories—a granddaughter who was a university student in Florence, the son who now ran the restaurant, the father/grandfather who made the pizzas. When we entered the restaurant, our server asked us where we wanted to sit and we chose a table near the prep station and wood-fired oven. Watching individual dishes being prepared with love and care was a highlight. To celebrate, we ordered a delicious bottle of champagne. Over the next two-plus hours as we dined on pasta and steak, we talked with the different family members and oohed and ahhed over our dishes. They clearly loved that we loved the experience and the food as much as we did. As our meal finally wound down and we polished off the last crumbs of our desserts, our server arrived with tiny, frosted glasses. As this was the second time we received complimentary limoncello at the end of a meal, I felt like I had passed the “test.” Italians want you to like their food. They don’t want false praise, but genuine enjoyment of good cooking. Tired and full as were at this point, we sipped our limoncello and nibbled on the small pieces of dark chocolate that our server included with our drinks with smiles on our faces. I love coffee. It it part of my morning ritual. But I don’t regularly drink cappuccinos or espressos. In Italy, cappuccinos start the day. At our hotel, a fancy machine served up hot coffee drinks for hotel guests at breakfast. I wanted to experience Italy like an Italian so I did the same, starting my day with a cappuccino, or two. However, the part I really came to love was the espresso at the counter at any point in the day. Actually, I ended up ordering a macchiato mostly, which is an espresso with foamed milk. I also don’t add sugar to my coffee, but I found I really liked the taste of the milk and sugar in my macchiato. For €1, sometimes a €1.20 for a macchiato, a person could grab a quick shot of caffeine at a gelateria, an auto grill, a bistro, a bar, and of course, a restaurant. Italians generally stand at the counter to drink their espressos because they are small and can be swallowed with one gulp. Again, I felt like a local standing at the counter drinking my coffee. I also found the hit of caffeine to be the right amount of pick-me-up in the late afternoon. The Tuscan landscape doesn’t disappoint. It was every bit as charming as the pictures and postcards portray it. I can only imagine how lovely it looks now with spring flowers blooming. I guess I wasn’t prepared to see stone farmhouse after stone farmhouse everywhere I looked. In addition, the terraced gardens with rows of olive trees and vineyards dotting the rolling hills added to the charm. Even driving along the busy Autostrada, the modern, high-speed highway, you can’t escape the rustic farmhouse in the distance. On some of our day trips, we had this view along with the snow-covered Apennine Mountains in the distance, delighting us as we drove from one destination to the next. Probably a favorite image was seeing the town of Cortona in the distance while driving to Orvieto. The sun-soaked hillside made me realize why Frances Mayes titled her book, which is set in Cortona, Under the Tuscan Sun. In my pre-trip reading, I knew that I was headed to a place where both men and women took fashion seriously. I was told I wouldn’t find an Italian dressed in yoga pants and a sweatshirt having coffee or lunch. Instead, one would be dressed for the day before heading out of the house for any activity. I certainly observed this reality during my visit. The only time I saw people in workout gear was at St. Luca, where a 5k run had taken place earlier that morning. What I found myself falling in love with, though, was the Italian, fashionably dressed or not. I loved watching the gestures, the mannerisms, and the expressions used when talking with friends over a meal or sipping an espresso at the counter. 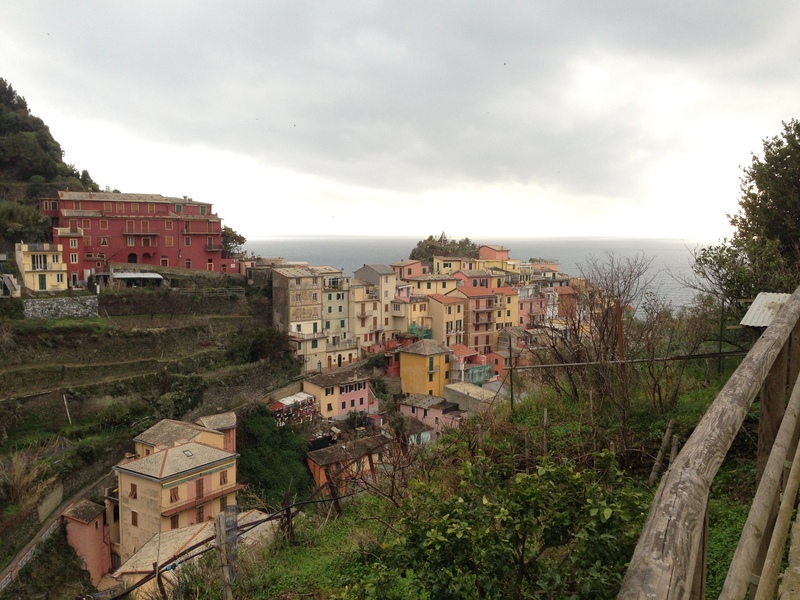 Throughout our stay, I encountered friendly, easy-going Italians. It was refreshing. I’ll be honest and say that I actually thought of a few responses I might give to a person once they learned I was an American. I was ready for the presidential jokes and comments. To my surprise, this never came up during any conversation. It seemed as if it didn’t matter where I came from. Instead, did I like my food? Was I enjoying my stay? These are my kind of people! However, I must add that I was surprised by how many Italians smoke. Thankfully, this wasn’t an issue inside restaurants or other enclosed places, but I saw young and old regularly lighting up during our stay. On Thursday, our first full day in Italy, we drove to Siena. So much to love about this city. I wish I would have had more time there. I could probably say this about most places we visited. 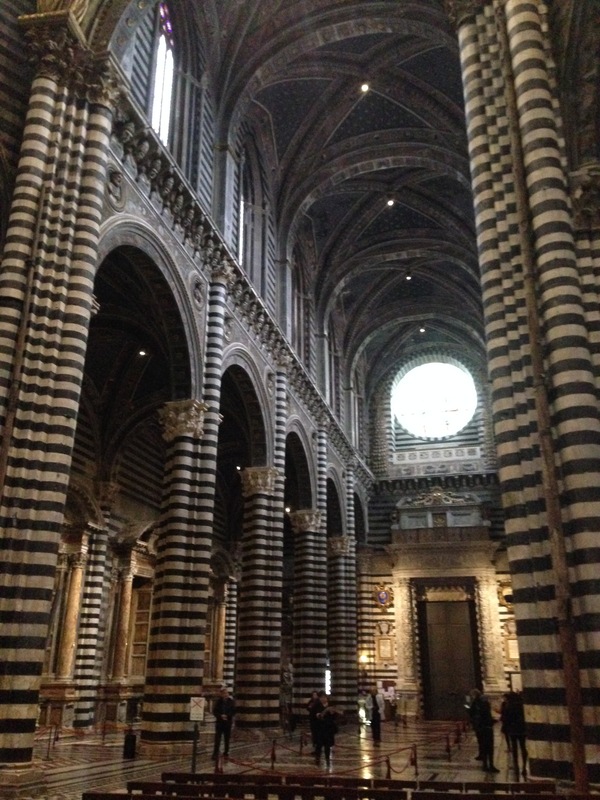 I think that the Duomo in Siena tops my list as a favorite. Maybe because it was the first one we toured in Italy. Something about the black and white marble used throughout the space, or the original, vibrant frescoes in the Piccolomini Library that hardly looked like they were painted 500 hundred years ago (! ), or the mosaic floor panel, one of many, that so beautifully and accurately depicts man’s attempt to control his own destiny and the folly of this way of thinking, moved me on many levels. On Friday, I stood close to Michelangelo’s The David and marveled over the fact that someone carved this sculpture out of a solid piece of marble. In the afternoon, I toured the Uffizi and saw more great works of art. On our last day in Italy, we climbed the steps of Milan’s Duomo to the terraced rooftop, enjoying the views of the piazza below. Despite the rain, we were amazed at the detail and intricacy of the spires all around us. The sheer size of the Duomo is also impressive. Again, I wished we had more time. It felt in some ways, that a person could spend a lifetime looking at art in Italy and still not see it all. I’m grateful for what I did see during our trip. Whew! There you have it—some of my favorites about Italy. Stay tuned for Part II. In the meantime, if you have been to Italy, I would love to hear some of your favorites. Very nice and true. Italy is pure: the cuisine, the coffee time, how Italian act. It is a very interesting country. I live in Italy, and I discover new things every single day! Alicia, your appreciation of all things Italian shines through! Plus the wonderful sensory overload that happens! Your postcard of the Duomo in Siena still graces our fridge door – a little reminder of la bella vita everyday.